This park offers a wide variety of water-oriented activities. Sunbathing, swimming and canoeing are popular activities at this lakefront park. It also has a fascinating nature trail that winds through lush coastal rainforest. All five species of Pacific salmon, as well as steelhead, rainbow trout and dolly varden can be found in the lakes and creeks around this park. Observe spawning salmon in Diana Creek during August and September. The day-use area is open from May 15th to September 15th and the entrance gate is locked daily from 11pm to 7am. Please note: Drinking water is no longer provided in this park. Please bring your own, or treat water appropriately before drinking. 16 km east of Prince Rupert on Highway #16. The closest community, town or city is Port Edward. There are paddling, canoeing and kayaking opportunities at this park. Sea kayak rentals are available in Prince Rupert. Bicycles must keep to roadways. Bicycle helmets are mandatory in British Columbia. Bikes are not permitted on the Diana Creek hiking trail. All five species of Pacific salmon, as well as steelhead, rainbow trout and dolly varden, can be found in the lakes and creeks around this park. Observe spawning salmon in Diana Creek in August and September. Anyone fishing or angling in British Columbia must have an appropriate licence. The park has a fascinating nature trail that winds through lush coastal rainforest. The trail is moderate and the length is approximately 3 km return. For your own safety and the preservation of the park, obey posted signs and keep to designated trails. Shortcutting trails destroys plant life and soil structure. Pets/domestic animals are not permitted in the day-use area adjacent to Diana Lake and must be kept on a leash at all times. Please obey all posted signs. You are responsible for their behaviour and must dispose of their excrement. Backcountry areas are not suitable for dogs or other pets due to wildlife issues and the potential for problems with bears. Swimming is available in Diana Lake. The beach is a mixture of rock and sand. There is a dam adjacent to the day-use area. There are no lifeguards on duty at provincial parks. Campfires are permitted within the fire rings provided. Visitors must supply their own firewood. To preserve vegetation and ground cover, please don’t gather firewood from the park. Dead wood is an important habitat element for many plants and animals and it adds organic matter to the soil. You can conserve firewood and air quality by keeping your campfire small. Limited burning hours or campfire bans may be implemented in some parks. Be prepared to bring a portable stove for cooking. 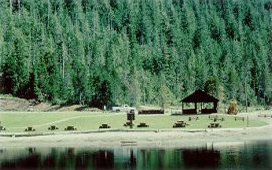 There are grassy areas and a covered picnic shelter for picnicking. The beach is sandy/rocky. Fire rings are available, however visitors must supply their own firewood. Please note that pets/domestic animals are not permitted in the day use/beach area however they are allowed at the creek side picnic sites. The gate is locked daily from 11:00 pm to 7:00 am. The day-use area is open from May 15 to September 7 and the gate is closed during the off-season. Walk-in is permitted. The pit toilets and picnic shelters are wheelchair accessible.